Are You Still Dealing With Ocwen By Yourself?! ?Are You Still Dealing With Ocwen By Yourself?!? What is an Ocwen Deed In Lieu Package? Ocwen Loan Servicing, LLC requires that when you want to apply for a foreclosure alternative such as a deed in lieu of foreclosure doing an Deed In Lieu Application Form or Request For Mortgage Assistance (what is commonly referred to as the Ocwen RMA) is required by Ocwen and their investor (the beneficiary of the note). This document must be completed correctly in order to start the first step towards getting to deed your home back to the beneficiary. You should try to use the most recent paperwork available. Prior to using any applications you should check with us (ACG), with another expert or even your Ocwen single point of contact because not only does Ocwen have their own package which may change at any time but their investor might require specific documentation as well. There are few professionals that you can call on that really specialize in the dealing with Ocwen and their deed in lieu of foreclosure process. Finding the right expert to work with is crucial because you should be able to avoid many of the foreseeable pitfalls that comes with the application of deed in lieu process. That’s why we put the latest paperwork we could find online to help you get a leg up. Helping you through the process is what we do. We offer a done for you service. Click here and fill out the form to request a call from a deed in lieu professional or call 888-934-3444. What is the Deed In Lieu Ocwen Hardship Affidavit? Pro Tip: Ocwen, when reviewing your application to deed the property back to them, may require you to attempt to sell the home first. This used to be a requirement but has been more flexible over the recent years. Submitting Your Deed In Lieu Package to Ocwen To Get The Process Going. What is in the Ocwen Mortgage Assistance Package? Across the industry lenders, including Ocwen Loan Servicing LLC, all require pretty much the same documentation. Even though you are trying to walk away in many cases they will require a listing agreement to see you’ve attempted to sell the home for more than 90 days. That’s only the beginning. As a deed in lieu requester they require you provide your financial information such as a monthly budget, your tax returns for the last two years along with a 4506t to show the returns were actually filed, pay stubs or proof of income like a profit and loss, bank statements, reason for requiring to do a deed in lieu, and a hardship letter. It’s all about the numbers! The only way a deed in lieu process can be completed with your servicer (Ocwen Loan Servicing LLC) is if they know what your home is worth and that is by completing a valuation of the property. The value in most cases is completed by a real estate agent/broker or appraiser who reviews the comparables in the area to establish what the home is worth. Reviewing the properties that are currently listed but more importantly the properties that are sold is key. Generally they want to see the homes that have sold within the last 3 to 6 months but this depends on the volume of homes actively moving in your local market. They consider your homes perceived condition, the size of the living space, the size of the lot, how many stories it has and whether or not it has a pool. Mortgages have different investors. Ocwen is responsible for representing the correct values to those investors so they can make their final decisions. Ocwen Loan Servicing loan’s beneficiary is already going to be taking a loss so in most cases they will hire a local agent or broker to do a value referred to as a BPO or Broker’s Price Opinion because it’s cheaper than an appraisal. That will not always work though. In certain cases the mortgage investor requires a deeper review to be completed by a licensed appraiser and one that is often certified by that investor to complete values as per their guidelines. Real Estate Appraisers are licensed specifically to value homes where as agents can give their opinions (hence Broker’s Price Opinion) but that can almost always be over turned by an appraisal. Some investors such as Fannie Mae (FNMA) complete two appraisals. The type of value completed varies from servicer to servicer and investor to investor. What happens when a value returns too high? What happens if your value returns too low? This happens all the time and it can happen to a novice or a true professional. As much as you may try to meet with the BPO Agent or the Appraiser and provide them information that they may use in their report often they are not from the area and compare properties that don’t have anything in common with the subject property. This is where you can come in and provide supporting proof to the lender such as a competing appraisal or set of comparables but choosing the right properties to compare is a skill set on its own. Call us today at 888-934-3444 and we’d happy to discuss any hold ups you may be experiencing in your Deed in Lieu. Pro Tip: Deed In lieu Value Variance is an opportunity to apply for a mortgage assistance servicer such as Ocwen to vary from their typical practices. Often values are good from the day they are completed for 90 days; Sometimes longer especially when it comes to a deed in lieu. Ocwen’s Deed In Lieu of Foreclosure Time Line Coming To An End. Once the value has returned and they have a complete package this is where Ocwen’s Deed In Lieu negotiator or underwriter makes the decision if you meet the minimum criteria to be submitted to management or the investor for approval. They will not submit anything they don’t feel will get approved by management and the investor because they get graded on their results. Often there are many layers before getting approved. An auditing process happens before the submission to management and if approved there is often another auditing process the occurs before an approval letter is issued to you the homeowner or the professional (such as our company) that is representing you. This is also the time when Ocwen may issue a decline to your deed in lieu request. Combating either a decline or the terms offered to you can be difficult. Often there are three main parts to an approval that matter most to you. The move out date and condition, what amount if any is allowed to go to you for relocation costs, and what is going to happen to the deficiency after the deed in lieu. The laws in different states may vary on whether or not they have the right to pursue you. Factoring many of these issue takes a special set of skills that can only be gained through experience. Anyone can get the easy ones done but it’s the difficult transactions that separates that experts from the trainees. The lender will want you to deliver the home in a well kept and broomed condition. They will generally give you about 30 days to move but that can often be negotiated. They may offer relocation money which will change depending on how quickly you vacate the property. Closing a deed in lieu is not unlike closing a typical real estate transaction. Once all lien holders and any mortgage servicers have approved the terms of the deed in lieu you can move forward grant deeding the property back to whomever you are instructed to deed it over to. By now a title search has probably been run by your lender as they will not want to take back possession of the property unless there are no longer any liens. 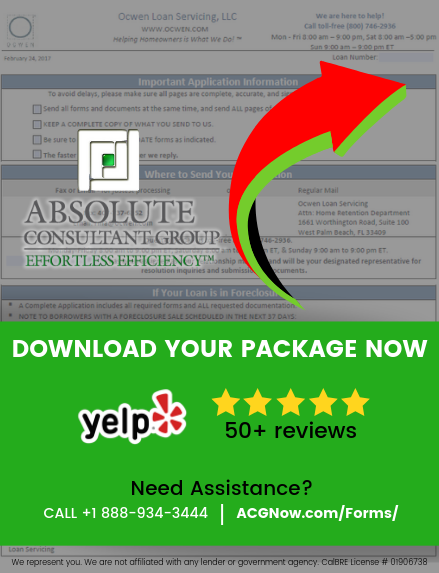 Absolute Consultant Group (ACG) handles the process of applying to your mortgage lender for deeding back your property. We streamline the process for you. ACG doesn’t charge upfront which is a good thing but did you know in the case that Ocwen doesn’t approve the transaction we don’t get paid a dime. In some cases the lender will even pay our fee. It’s a no risk opportunity to work with the right team to help you with your mortgage. Call for details 888-934-3444. If there’s anything you can take away from the process you may already be aware from the Ocwen Deed In Lieu Application is a lengthy document. Ocwen Loan Servicing LLC hasn’t simplified the process much better either. To make your life easier ACG has put in the time and the efforts to offer you a streamline process of application for the deed in lieu with a few steps as possible in order to reach your mortgage assistance goals. Ocwen Corporation, operating out of Palm Beach Florida. outsources a very large part of the process and often that leaves you talking to someone overseas. Locally founded here in the USA our company becomes your single point of contact for all of your Ocwen challenges. Stop having your time wasted. You will no longer have to deal Ocwen‘s loan servicing department in India. With us you get someone here in the states to work with. You and your Ocwen Mortgage with ACG are in good hands. When you work with Absolute Consultant Group for all your lender needs we become your one stop shop for working with Ocwen’s deed in lieu process or any other mortgage assistance programs from start to finish. What is the Ocwen Deed In Lieu Package? Ocwen Mortgages require an Ocwen Deed In Lieu Package known as the Ocwen Request for Mortgage Assistance (Ocwen RMA) to be completed in order to apply. It’s important to always use the most up to date paperwork when applying; Always check with a professional. The paperwork we last found was put up on the Absolute Consultant Group (ACG) Website. ACG helps homeowners with their Ocwen Mortgage deed in lieu process. There are 19 Sections to the standard Ocwen deed in lieu forms and totaling about 20 pages. Section 1 RMA- Statement Of Intent where you designate the type of help you are looking for. 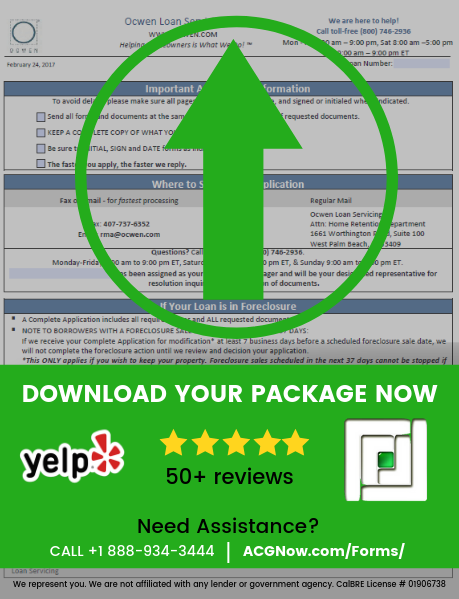 Section 3 Ocwen Package – Property Information Form – This has basic information about the home you are deeding back. Section 3A Deed In Lieu Package – If you do not occupy the property information. Section 12 Deed in Lieu – Non-Borrower Consent Form to apply for a deed in lieu.